Earth Day is coming up on 22nd April, and is an ideal time to remind children about recycling and taking care of our Earth. 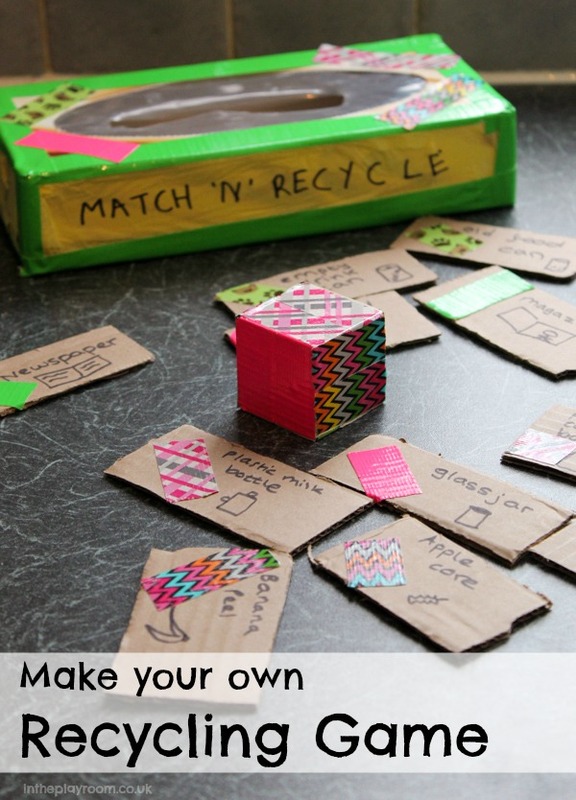 We love junk modelling and diy games, so we decided to combine both of these activities and make our own recycling game – out of recycled materials of course! 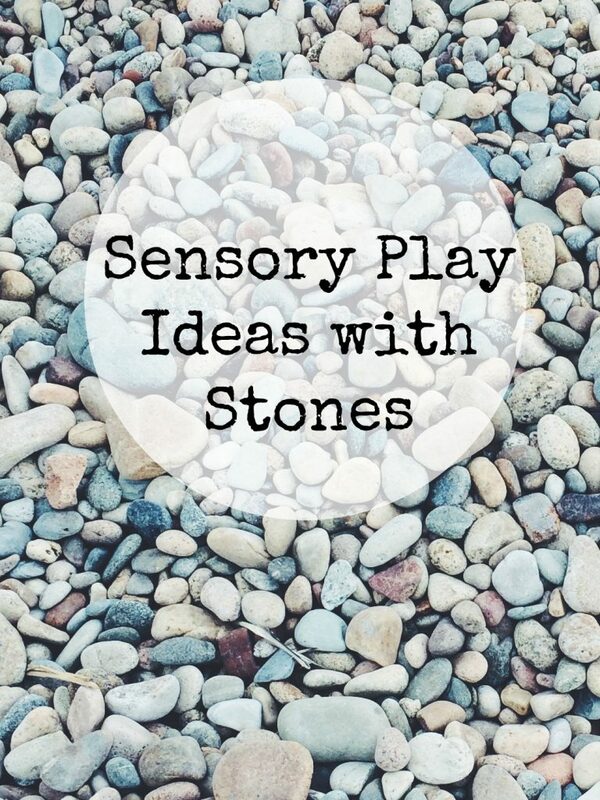 It’s fun to make, and fun to play – so two activities in one. 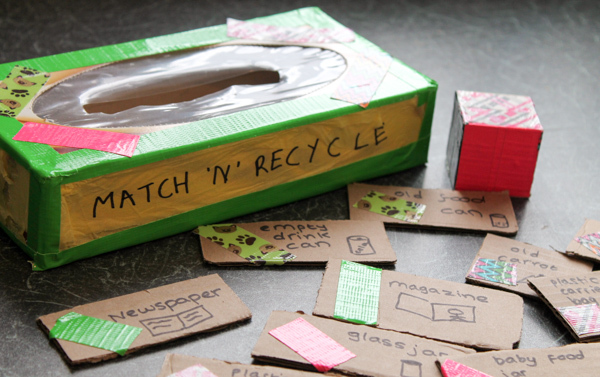 This recycling game is a posting game, so you are going to make the tissue box into the posting box where all the “recycled items” will be posted in. You could make several post boxes for each type of recycled material but it will be a little more time consuming, and take up more space so we decided to just use the one box. 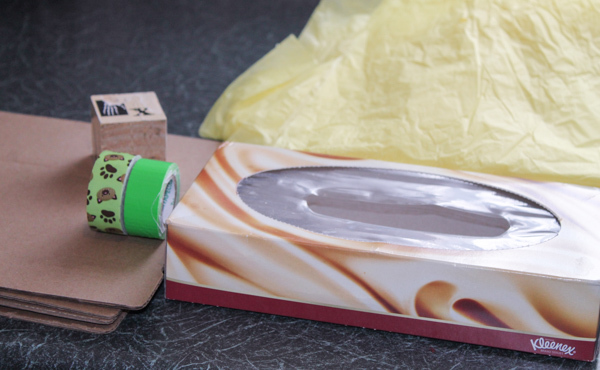 Cover your box in tissue paper and decorate it with stickers, tape or however you prefer. Next, you need to transform your old wooden block into a dice for the game. 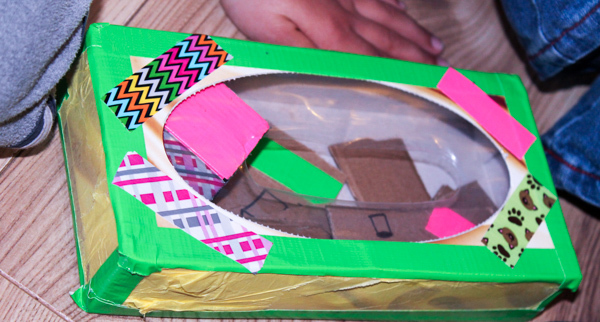 We covered each side with a differently coloured and patterned design of tape – six in total. We decided that rolling a black means that you miss your turn, which left us with 5 different colours to assign to different types of recycling. We made several cards and wrote different recyclable items on them, along with a small picture to help the younger players who can’t read well. 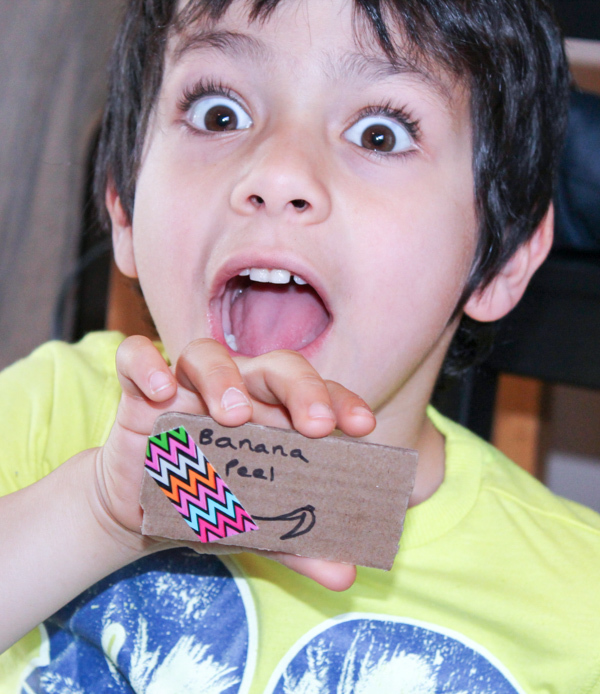 Each category was labelled up with a small strip of coloured or patterned tape. So all the food waste has a zig zag patterned tape, and all the paper waste has a green tape and so on. Place all of the recyclable item cards upside down on the floor or table. Each player will take turns to roll the dice. If you land on a colour, for example green, then you need to pick out a green card. This starts off as a game of chance, and then becomes a memory game as children remember where each card was located. Once you pick the matching colour that you need, you can post it into the recycling box and the player who posted the post items wins. It’s pretty simple and all of my kids 3-6 were able to grasp these rules and enjoy this simple game. 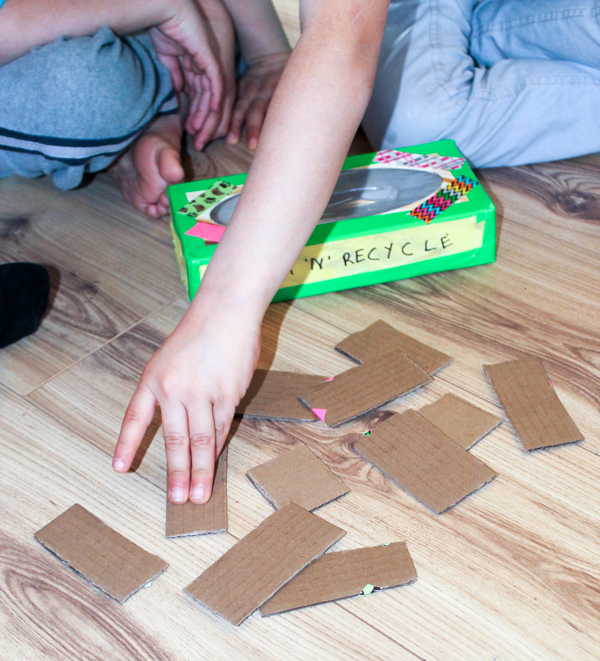 It’s a fun way to think and talk about the type of items that can be recycled as well as working on matching patterns, turn taking, and practising reading the words. 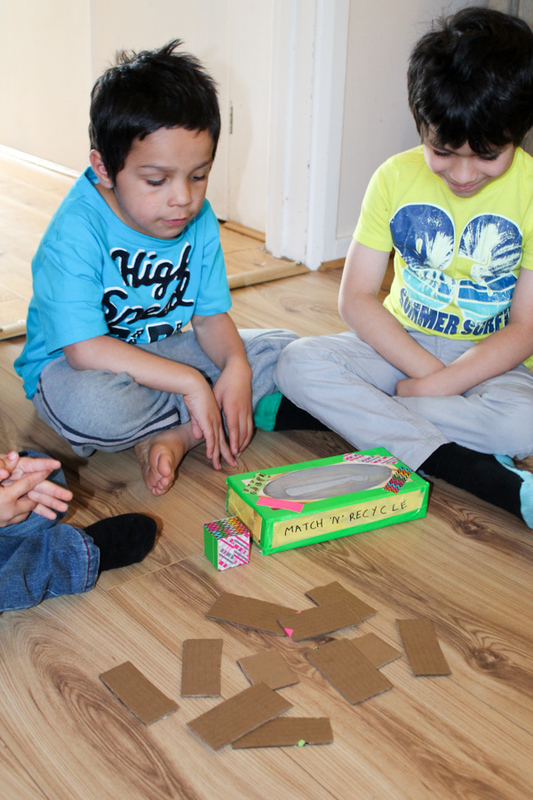 Once the game was finished, we reversed it by rolling the dice and then trying to pick a correct card back out of the recycling box which brings in a bit of extra fine motor practise. We then sorted all the cards into their categories and talked about the materials and why certain items were grouped together. When you’re done, everything fits inside the box so that you can easily keep it for another day. 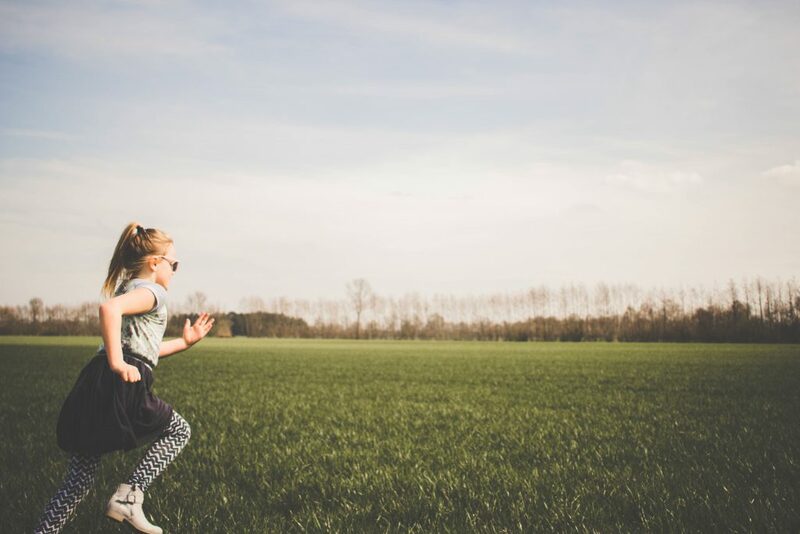 This post is part of the “Every Parent’s Guide to Natural Parenting and Earth Day” blog hop. 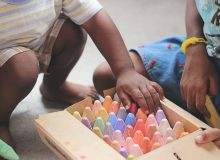 Check out the rest of the series to find even more great ideas for recycled crafts, and green parenting. 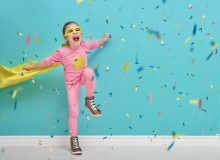 You can also enter to win some awesome natural parenting prizes through the main series link above. What a lovely idea, it looks like a lot of fun too. Plus I like the way you can store everything in the box when they’ve finished playing. 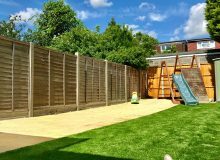 You are so clever Anna – love this idea! Great idea, Ana! You are so creative! 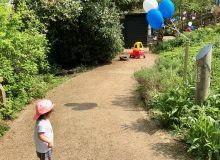 As someone who works in a rubbish removal company , I’m really happy when I’m seeing people who are trying to reduce their waste and most important- give good example and teach the next generation to care about the environment. You are great role model! Such a nice idea! I’m sure my boys will like it very much, plus we are already talking about recycling at home and this game is very relevant at the moment. Thank you for sharing! Greets! All parents want to leave the world a better place for their children. 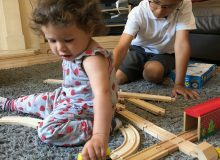 While it sometimes feels like we don’t have much control over what happens down the line, one of the best ways to ensure that there will be a healthy planet for future generations is to teach little ones about recycling now so that they grow up with an awareness about waste and an appreciation for preserving resources. Such a fun way of teaching kids some eco-consciousness! Love it!